If asked to name some of Australia’s World Heritage sites, most of us could probably stump up the Great Barrier Reef, Ningaloo, Fraser Island, the Blue Mountains, Kakadu, Shark Bay and the Sydney Opera House. One less well known site is the Washpool-Gibraltar Range World Heritage area, which is part of the World Heritage listed Gondwana Rainforests of Australia. Washpool-Gibraltar protects the largest area of unlogged coachwood (Ceratopetalum apetalum) forest in the world. 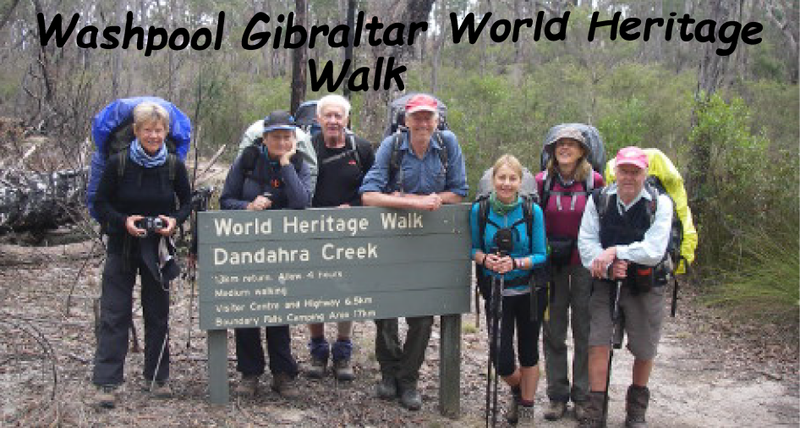 The Washpool-Gibraltar World Heritage Walk offers an easy four to five day, 45 kilometre wilderness hike through this magnificent landscape. 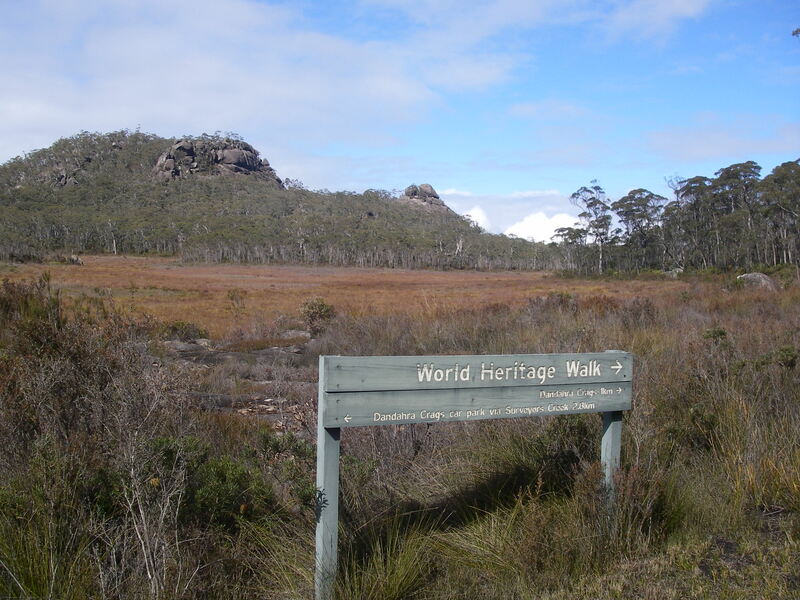 The walk follows a network of 4WD tracks, roads and walking trails. Radiating from the main circuit walk are any number of varied side trips, a handy additional 20 kilometres for walk leaders who need to keep those eager beavers happily engaged. And so, two vehicles bulging with eight bushwalkers and their assorted clutter docked at Mulligan’s Campground on a blustery Sunday afternoon in late August. My hardy and experienced walking companions were Chris, Sally, Eva, Leanda, Brian, Bernard and Peter. And they needed to be hardy given the unseasonable late winter weather. 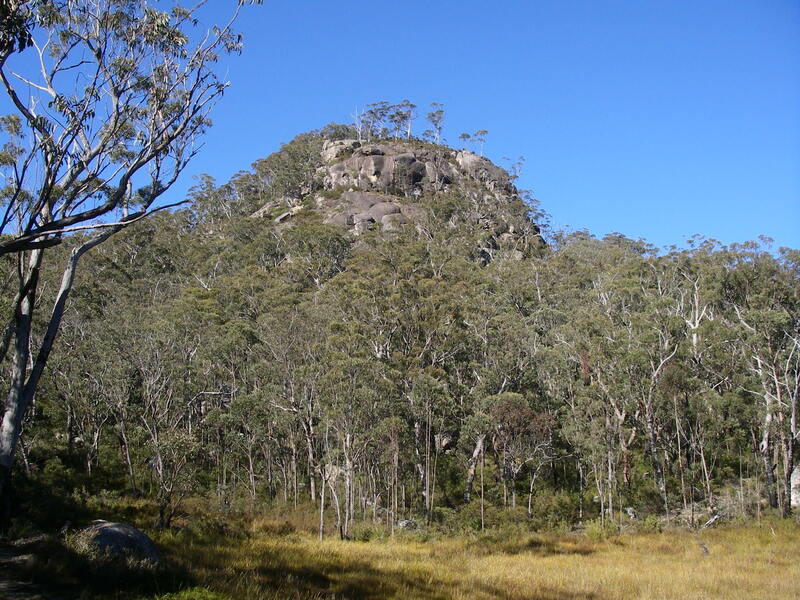 Gibraltar Range National Park is predominately a typical granite landscape ( Dandahra granites), the exposed tops of the New England Batholith, a massive granite intrusion that stretches 400 kilometres from Tamworth to Stanthorpe. Gibraltar averages about 900 metres in altitude and displays a mosaic of rainforest, dry sclerophyll forest and interesting sub-alpine swamps. 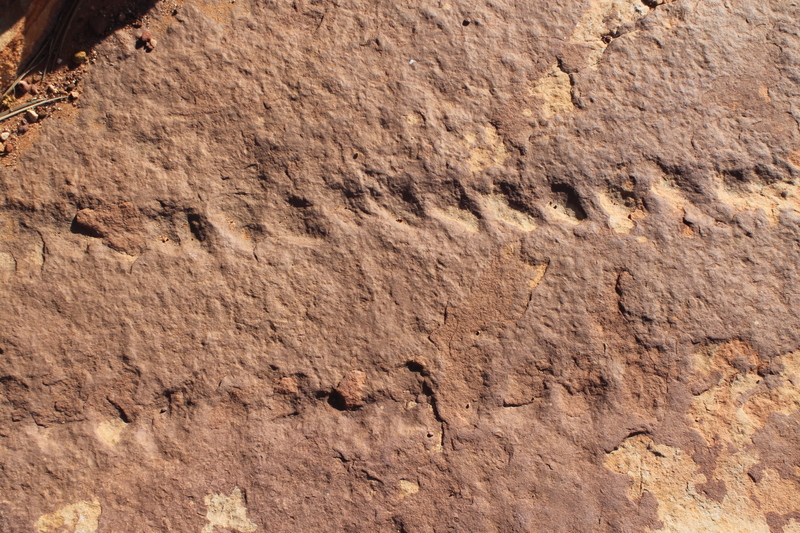 Washpool National Park, on the other hand, is made up of basalt and metamorphics. It is clothed in rainforest and wet sclerophyll forest where Coombadjha Creek and Washpool Creek have incised deep gorges into the eastern escarpment of the Great Divide. Washpool contains some of the world’s best remaining stands of Gondawanan rainforests and was the site of significant conflict between loggers and conservationists in the late 1970s. ” Dramatic and diverse changes in the landscape are typical along the walk. Dry sclerophyll forests, set amidst a broken collection of ridges and granite tors, surround a mosaic of sub-alpine swamps. In more dense country, lush rainforests safeguard the largest area of coachwood in the world. Within these ancient pockets of wilderness, waterfalls plummet from a lacework of streams and wild rivers. They offer refuge to a rich variety of wildlife including many rare and endangered species. In spring and summer the heathlands, swamps and open woodlands erupt in a colour display of wildflowers. Our first and last nights were spent at Mulligan’s Campground, very comfortable. It is decked out with a clean tiled amenities block, gas BBQs, a cavernous kitchen/picnic shelter sporting stainless benches, picnic tables, tap water, and ample pre-split firewood. Did I mention the cold showers? Not that anyone displayed any enthusiasm for showers with minimum overnight temperatures hovering between 0°C and 3°C. Washpool’s Bellbird Campground was similarly well appointed, lacking only the tiled amenities block, so no cold showers and flushing toilets. But if you are particularly well insulated you could duck off to have a swim in one of the many pools in nearby Coombadjha Creek. A word to the wise: remember to pack your food away every night. Even Bernard’s bombproof Bear Bag wasn’t up to the predations of the local nocturnals. Although the bag wasn’t ripped open, our furry friends mulched his cereals and nuts through the bag’s fabric. The kitchen shelters at Mulligan’s and Washpool were a godsend, dry refuges from unseasonal evening drizzle. Shelter Shed @ Grassy Ck. Grassy Creek is a wilderness camp but has the luxury of a picnic table, a fireplace and ample water from nearby Grassy Creek. Ten kilometres to the south, Boundary Falls Campground is more than adequate for hikers: picnic tables, long-drop toilets, fireplaces and firewood provided. Just be prepared to share it with four score and twenty Winnebagos. Much of the Washpool-Gibraltar walk is on high range and plateau terrain with an elevation of over 950 metres, consequently expect some cold wet weather. 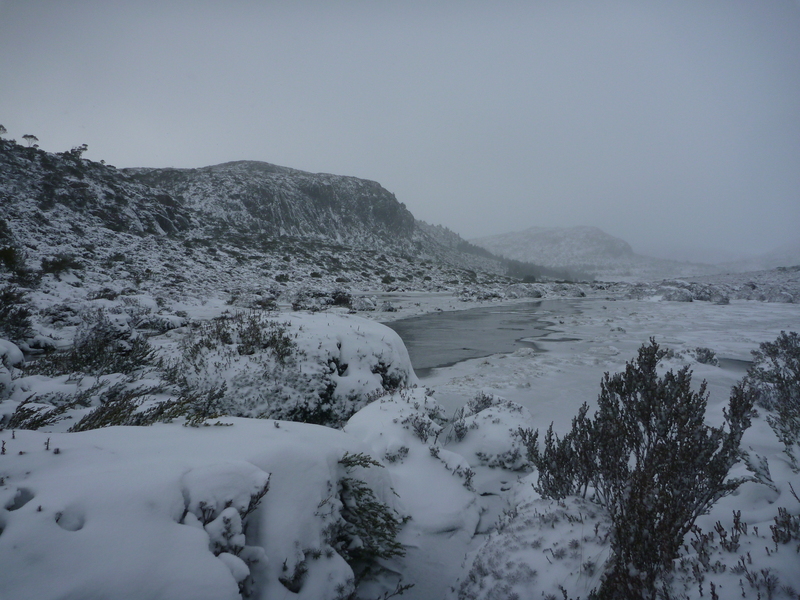 I was impressed with my walking crew: even the -11°C temperatures recorded earlier in winter or the rain bucketing down on the day before our departure had not deterred them. But reality gripped on the first day of hiking with westerly winds gusting up to 74 kph and the maximum temperature creeping up to a miserable 8°C. Maximums on the rest of the walk struggled to reach 15°C. 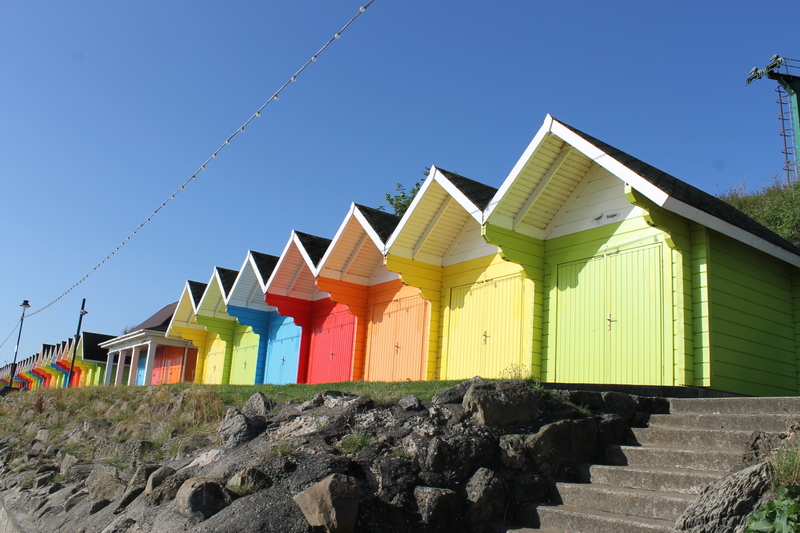 Late August is typically dry and sunny with cold nights but we experienced the full gamut of weather conditions: sun, drizzle, wind and frost. Fortunately it stayed dry during the day’s walking and we had fires every night for warmth. No real hardship for this lot. Early September, wildflower season, is a good time to go. Visitors Guide: Washpool & Gibraltar Range. 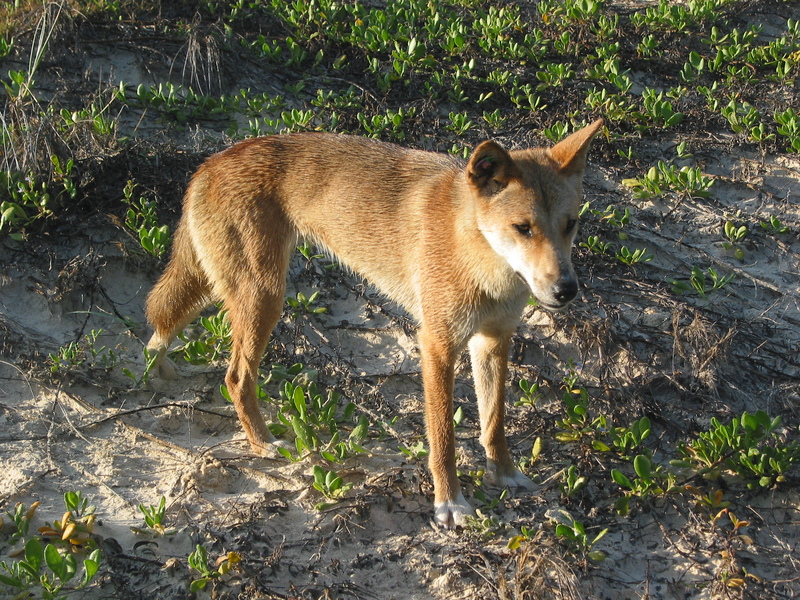 (NSW National Parks and Wildlife Service). J. Cavanaugh: Waratahs and World Heritage. (Wild Magazine, no.71, 1999). Q. Chester: Early warning. (Aust. Geog. Vol 91. 2008). C. Twidale: Structural Landforms. ( ANU Press. 1971). 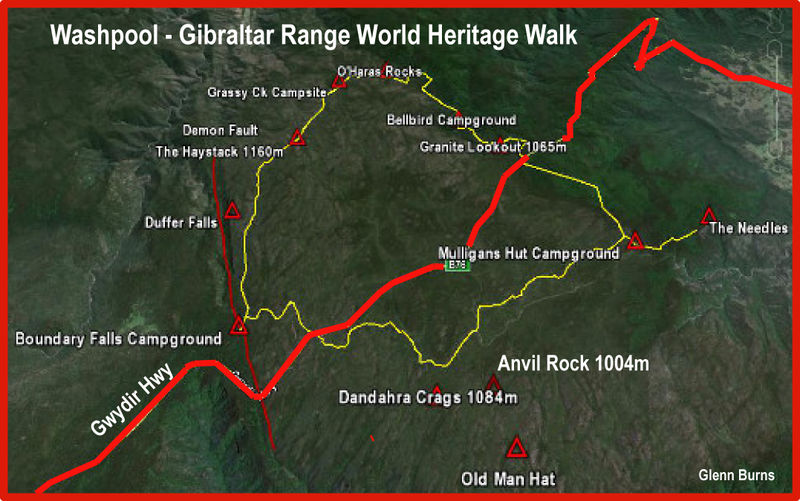 Map: Walks in Washpool & Gibraltar Range National Parks. 1:50,000. GDA94. This is an excellent PDF map available from Glen Innes office. 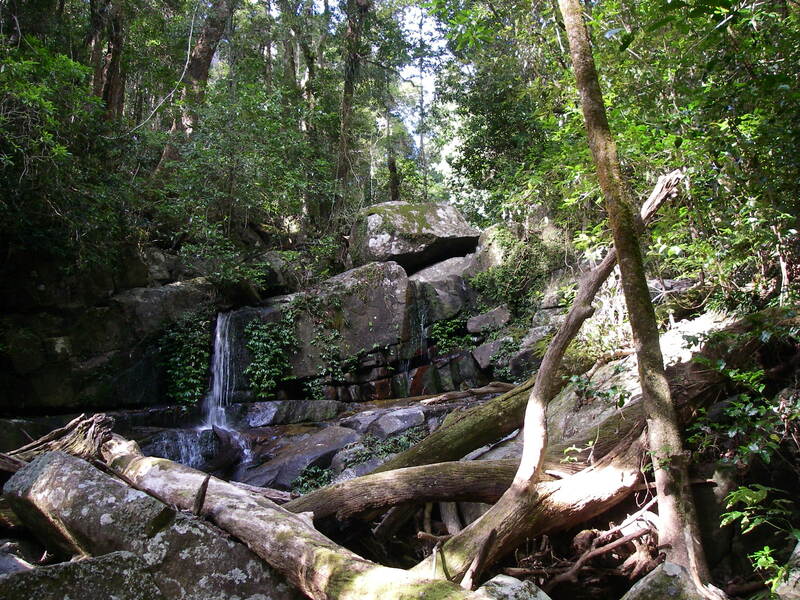 Map: World Heritage Rainforests of Nth NSW. 1: 850, 000. (Aust. Geog. Vol 91. 2008) . 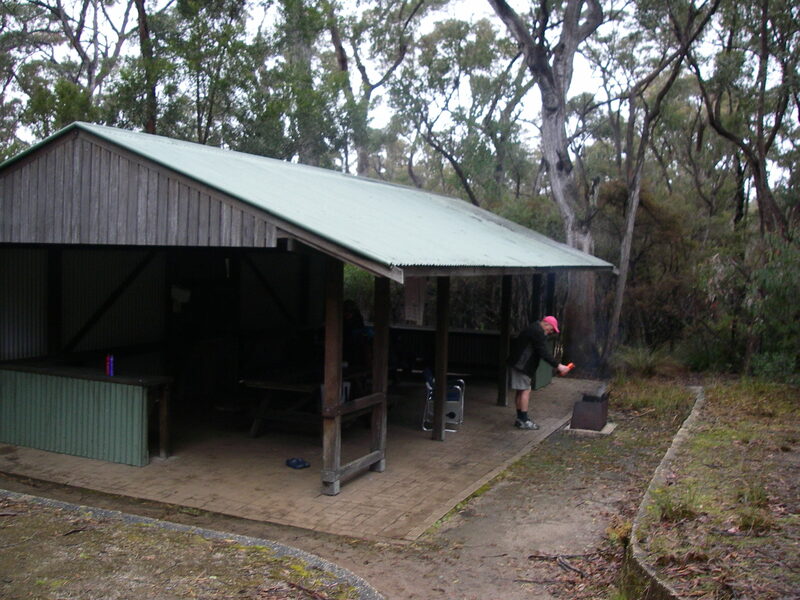 Our walk was in an anti-clockwise direction beginning and ending at Mulligans Hut Campground. 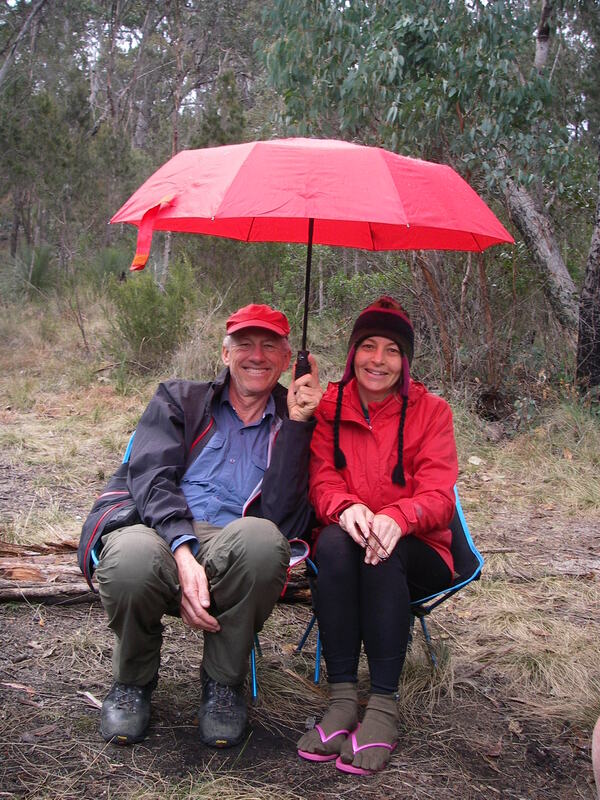 Monday: Mulligans to Bellbird Campground via The Needles and Granite Lookout: 12 kms. Reality gripped early Monday morning with the gusting westerlies and the daily maximum temperature creeping up to a miserable 8°C. Fortunately help was on hand, for, just on daybreak, Brian was already rattling around, stirring up our camp fire and dispensing mugs of steaming hot tea. 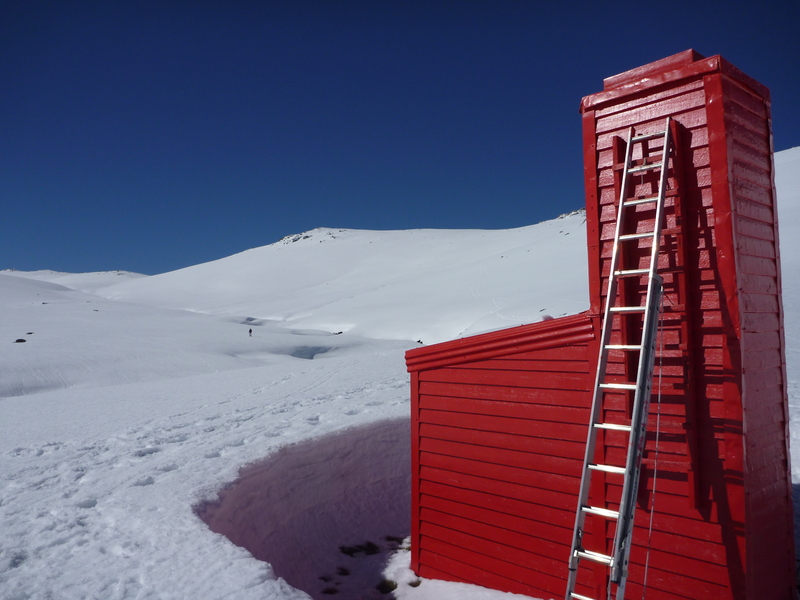 Soon after 8.00 am we toddled off on our little adventure, pulling up a mere five minutes later at Mulligan’s Hut, a slab construction on the banks of Little Dandahra Creek. 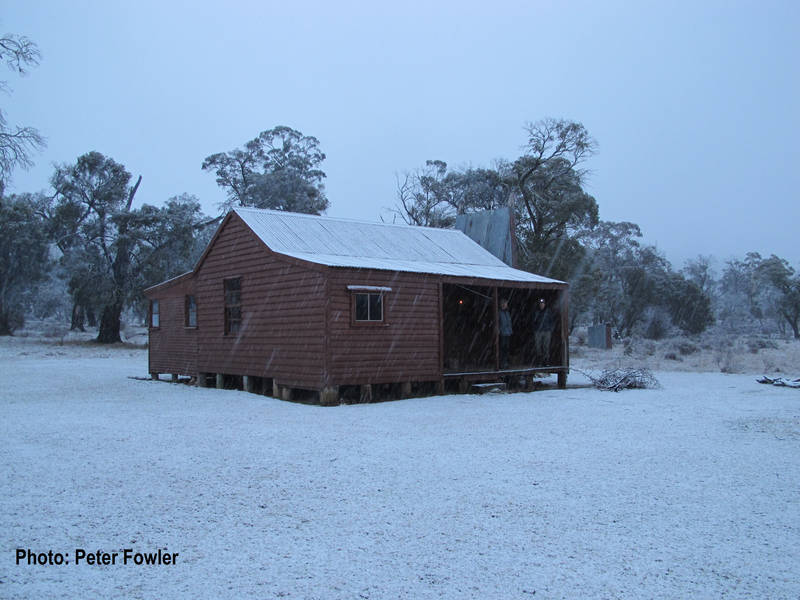 The building that remains is actually a set of stables with the original hut wiped out in the bushfires of 1964. Bill Mulligan was a business man who proposed a hydro-electric scheme in the Dandahra catchment in the 1920s. He hoped to use the hydro-electricity to power a copper mining operation at the base of the escarpment. Perhaps that says something about the rainfall regime of this area. The climatic regime is influenced by the position of the two parks on the eastern fall of the Great Escarpment with some areas receiving 1200 to 1300 millimetres annually. Afternoon wind flows are often from the east coast, laden with moisture so that afternoon and evening drizzle/rain and thunderstorms are a feature of spring-summer weather patterns. In the same area as Mulligan’s Hut was a memorial bench seat to Roly Paine. I first came across his name as co-author with Margaret Hodgson in our family copy of Field guide to Australian Orchids. Roly served for many years as Superintendent of Gibraltar Range National Park and later as a Publicity Officer for NSW Parks. He also became well known for his wildlife photos. Our first major stop was at The Needles, six granite pinnacles rising to about 80 metres above the valley sides. Initially the track follows the original stock route used from the 1860s to the 1970s. It then joins an old logging track that accessed stands of valuable temperate rainforest. Softwoods from these stands were logged and sent down the range to ply mills at Grafton. The stock route was revoked on the declaration of the national park and the logging ceased at the same time. An aboriginal legend suggested that The Needles were six sisters who were turned to stone by the curse of an unsuccessful pursuer. An oft repeated theme in aboriginal mythology. The rest of the morning’s ramble took us through rainforests and out to the Gwydir Highway thence to the Granite Lookout (1065m) for spectacular views of Mt Warning(1156m) nearly 150 kilometres NNE. Mt Warning or Wollumbin in the aboriginal language of the Bundjalung people, is the plug of the massive Tweed Shield Volcano, thought to have risen two kilometres above sea level and have had a diameter of 100 kilometres. It was named Mt Warning by Captain James Cook when he sailed along the northern NSW coast on 16 May 1770. But much, much closer to us I could see The Haystack (1160 m), which we would climb two days hence. 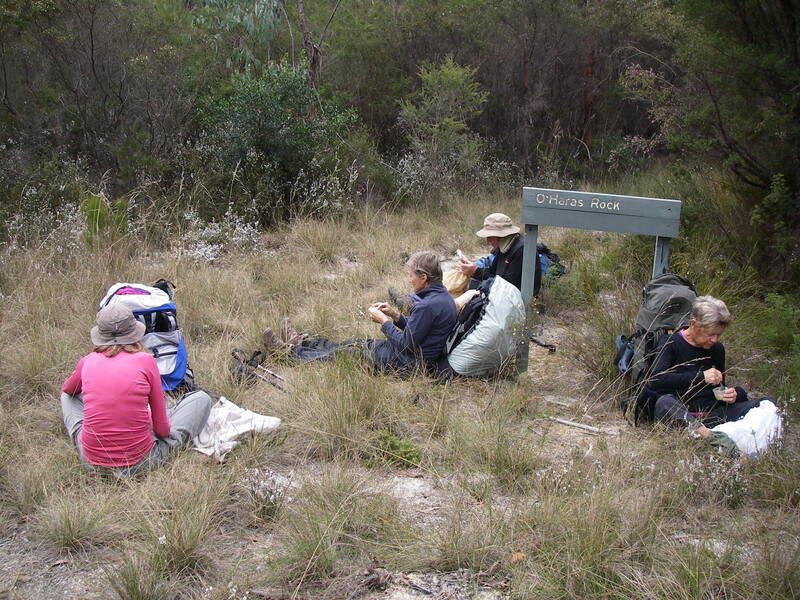 After a leisurely lunch hunkered down in the shelter shed out of the wind, we backtracked to Coachwood Drive and wound steeply down to our campsite in the Bellbird Camping area. Another five star home away from home, set deep in the rainforests of Washpool National Park. 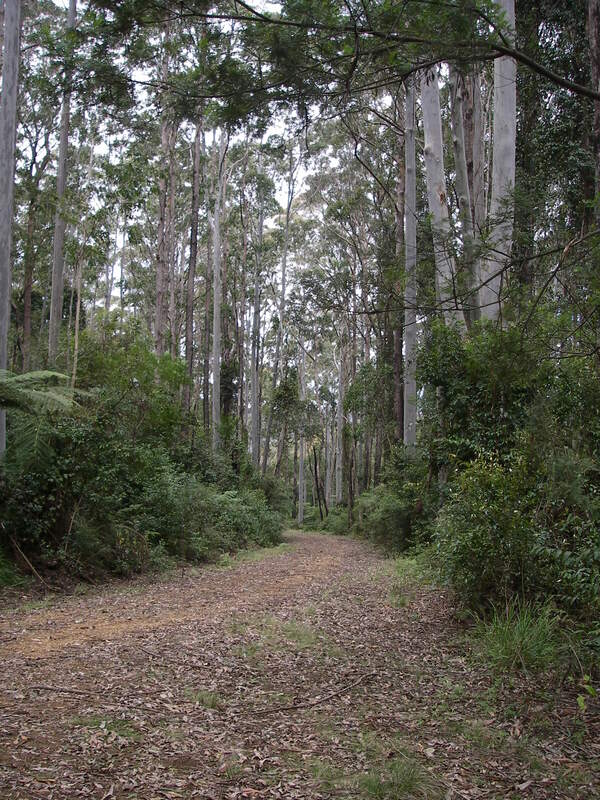 Washpool National Park was declared a wilderness in 1985 but it had a long history of logging dating back to the 1800s when red cedars(Toona ciliata var. australis) attracted timbercutters with their axes, cross-cut saws and bullock teams. The late 1970s saw protest action from conservation groups to protect the Viper and Willowie Scrub, by then under pressure from a now highly mechanized forestry industry. Willowie being the largest undisturbed rainforest in N.S.W. as well as having the largest stand of unlogged coachwood in the world. 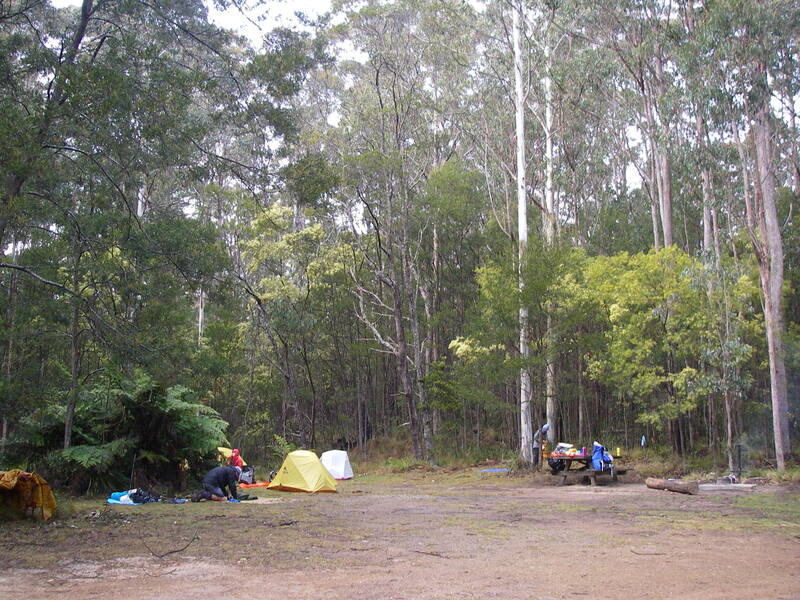 Tuesday: Bellbird Campground to Grassy Ck Campsite via O’Haras Gap: 10 kms and The Washpool Walk: 8.5 kms. Another shortish day. After getting myself tangled up in some argy-bargy with the troops about the early starts we agreed on a civilised departure time of 8.30am for the remainder of the walk. 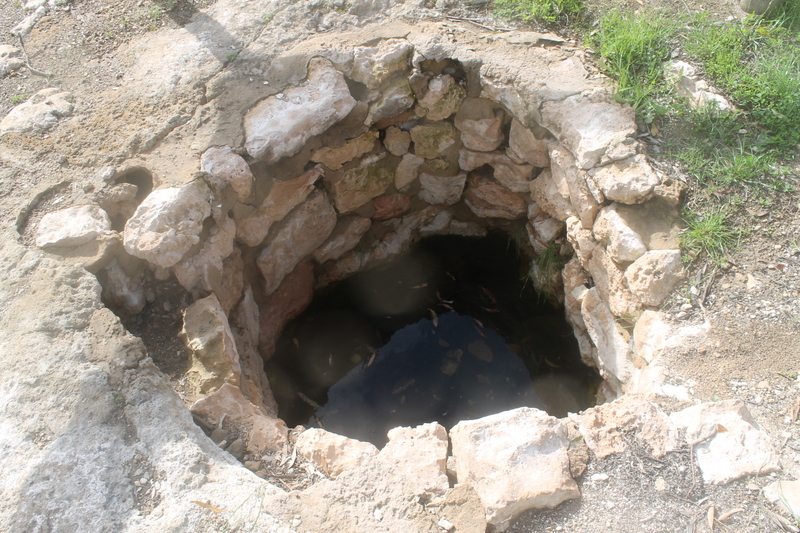 But first, a not to be missed side trip on the 8.5 kilometre Washpool Walk. This is definitely the showcase walk for Washpool. It starts in warm temperate rainforest at about 800 metres and climbs through subtropical rainforest, wet sclerophyll forest before topping out in dry sclerophyll forest at about 900 metres. 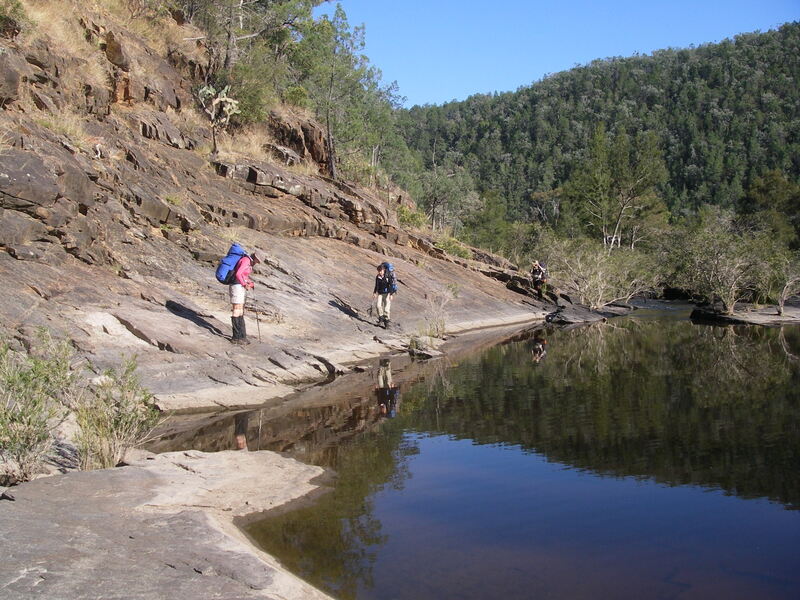 This walk is a great introduction to the Gondwana Rainforests of Australia. When the Australian continent finally broke away from Gondwana about 50 million years ago, it had on board plant families and fauna that it shared with other southern continents of Asia, Africa and South America. Today, remnants of this Gondwanan Ark can be found in the rainforests of Tasmania, NSW and Queensland. 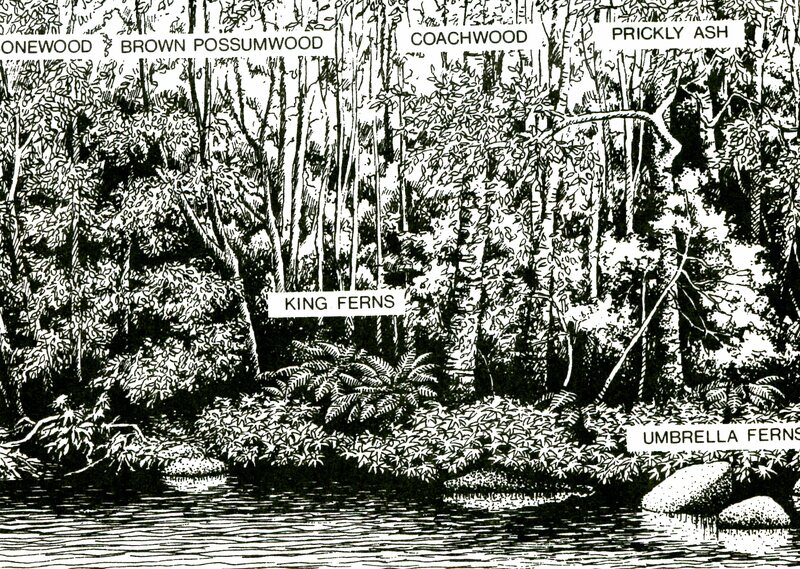 As a Queenslander familiar with subtropical rainforest, I was keen to see Washpool’s warm temperate rainforest. Typically it grows on poor soils and is characterized by relatively few canopy species with slender trunks lacking buttressing ( coachwood and sassafras). Large vines and epiphytes are present but not abundant. Large palms and stranglers are rare but small palms and ferns are a common feature of the understorey. The warm temperate rainforest usually occurs at altitudes of 450 metres to 1200 metres under a higher rainfall regime. Warm Temperate Rainforest. 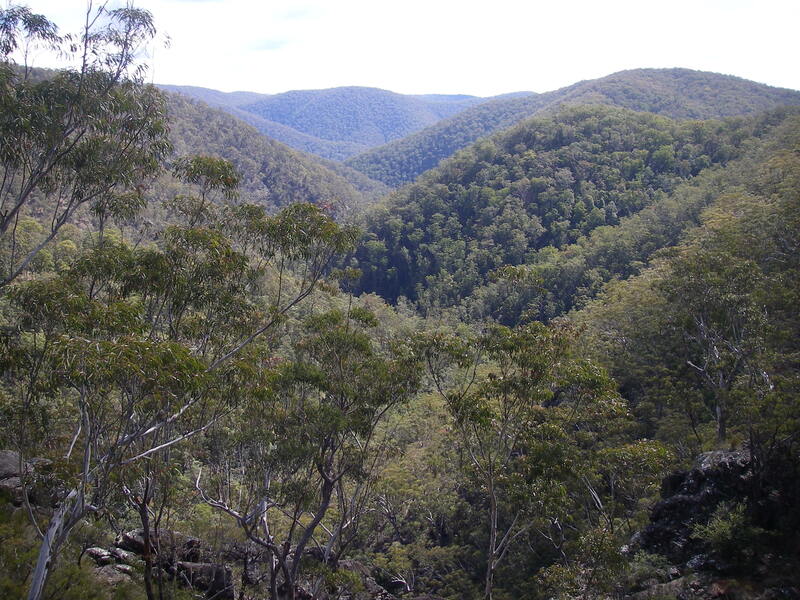 Source: NSW NPWS Brochure. Another interesting find of this walk was remnant stand (about 10 trees) of the towering red cedars, untouched by logging operations. They had been found by Athol McKinnin and Don Running from the nearby Boundary Creek Sawmill in the late 1960s. These cedars were left because of the high royalties payable on them and the lack of volume market for red cedar. We walked this circuit track in a little under three hours, taking in waterfalls and stands of red cedar but I would recommend spending at least half a day or more on this walk and staying an extra night at Bellbird. Bellbirds aside, the star of the avain world for us was the Superb lyrebird (Menura novaehollandiae). Several were sighted and certainly their scratchings easily found. 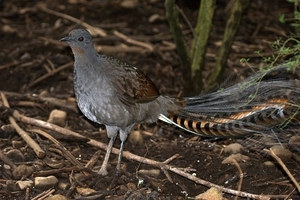 The lyrebird is known to most Australians by reputation. Few have seen them in the wild. But all Australians know that this bard of the bush can mimic a range of sounds including other birds, mobile phone ring tones, camera shutters, axes, chainsaws and motorbikes. Noisy but much rarer, and a declared vulnerable species, is the Rufous scrub-bird (Atrichornis rufescens). which we did not see. Its range has been significantly reduced by logging, clearing and burning of habitat. Washpool-Gibraltar Range World Heritage area protects habitat for this elusive mountain dweller. The reminder of the day is spent winding up through rainforests and sclerophyll forest on the Moogem and North West Trails to O’Haras Rocks and O’Haras Gap (1002 m), an altitude gain of only 200 metres, but it seemed an eternity. O’Haras Rocks were a tad disappointing. This jumble of small granite tors was not the lair of some 19th century bushranger but merely a campsite for grazier John O’Hara who camped there with his cattle in 1873. O’Hara was looking for an easy droving route across Gibraltar Range to the east coast. Peter made full use of O’Haras Rocks for some impromptu bouldering. With showers threatening we raced on to the old gold mining area of Grassy Creek, possibly known as Deannes Prospect which operated as shafts and shallow pits from 1899 to 1902. Tents up, Peter and I went for a sniff around and found an abandoned shaft and other mining knick-knacks. 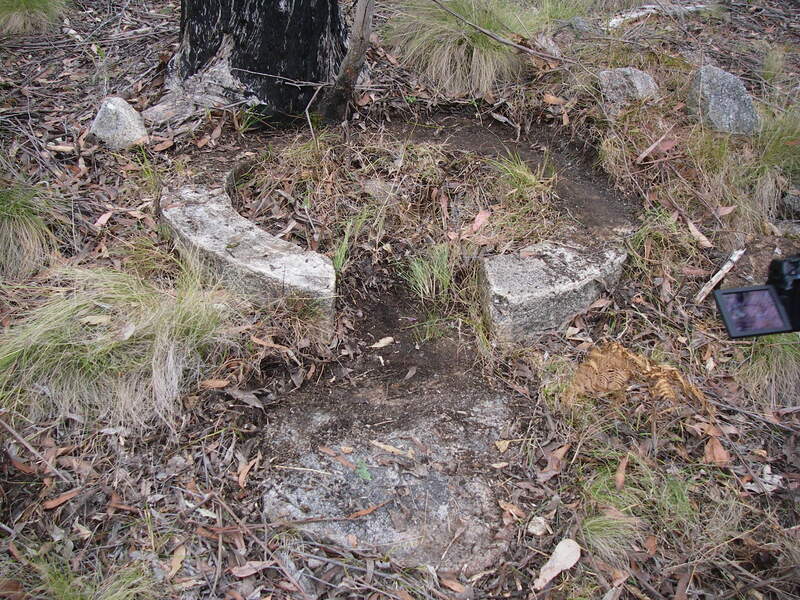 Apparently there is an old stamping battery and boiler from tin-mining operations in the 1870s. I couldn’t find them but now, on reflection, I wished that I had tried harder. Grassy Creek would be brilliant in sunny weather but was a tad bleak in the inevitable drizzle that rolled in late afternoon. What am I ? Found next to a small mine shaft. 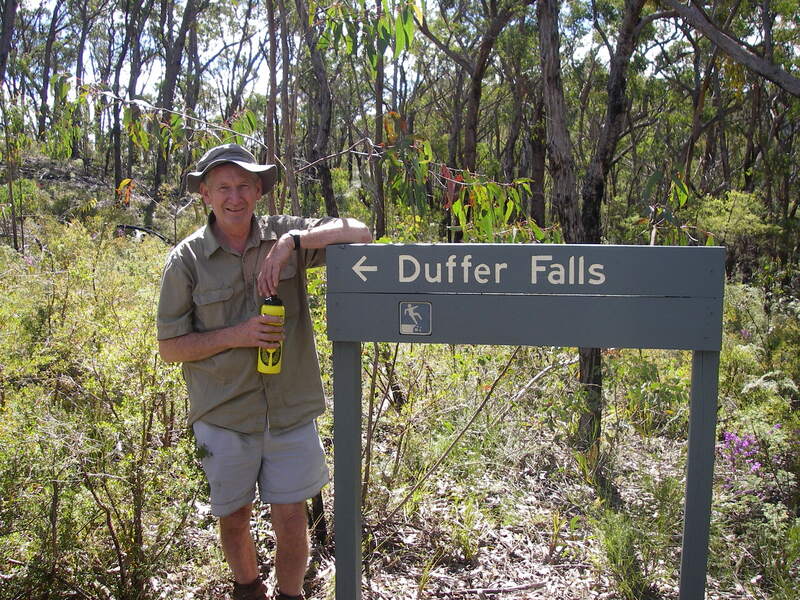 Wednesday: Grassy Creek to Boundary Falls Campground via The Haystack and Duffer Falls: 12 kms. A sunny start to the day as we continued along the North West Trail passing several sub-alpine swamps. These swamps or bogs are areas of impeded drainage where vast slabs of granite form an impervious layer, restricting the downwards flow of water. 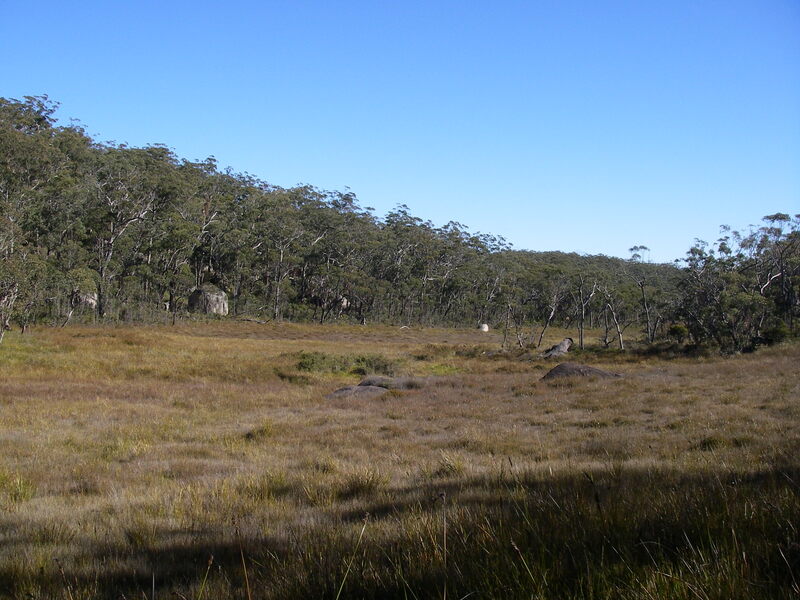 The bogs have comparatively few species, principally Baeckea omissa, Epacaris obtusifolia and Leptospermum arachnoides, all of which are highly restricted to these high altitude wetlands. 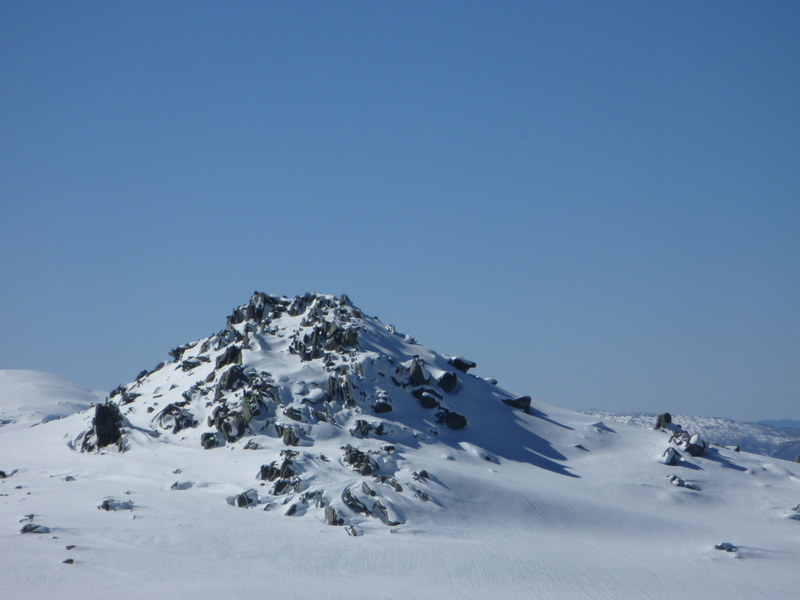 After three kilometres we dumped packs and clambered up onto The Haystack (1160m), an inselberg from which we had views over the granite landscapes of Gibraltar Range to Old Mans Hat (1085m), off to the south east. Our lunch stop was Duffer Falls. Possibly a reference to cattle duffing? Not to the three elderly gents seen creaking down the goat track to the base of the falls. But my real reason for checking out Duffer Falls is that its western fall gives clear views of the Demon Fault. For you earth science buffs, I discovered from my favourite earth science blogger, that Demon is a transverse fault with a movement of about 17 kilometres in this vicinity, the eastern block moving south relative to the western block. And onwards to Boundary Falls Campground just in time for our evening dose of light drizzle. Fortunately Brian was able to work his old pyromaniacal magic and kept our camp fire ticking over. Boundary Falls Campground is the site of the old Ben Wade and Sons sawmill. 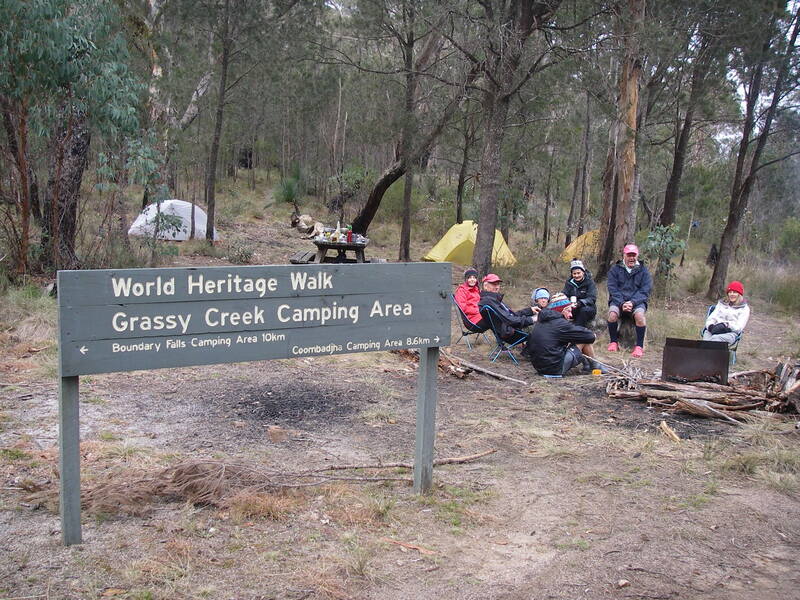 Thursday: Boundary Falls Campground to Mulligans Campground: 17 kms. Our final day on the track. Clear skies again. 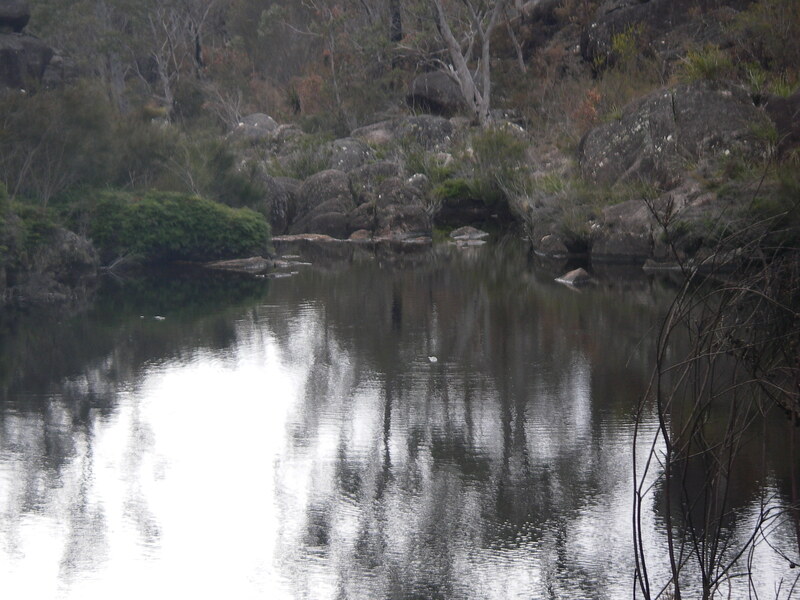 An easy walk through Gibraltar’s granite terrain following Tin Ore Creek Trail out of camp, across the Gwydir Highway, thence to the swampy Surveyors Trail and finishing along the Little Dandahra Creek Trail. The highlight of the day for me was the sighting of several platypuses frolicking in Little Dandahra Creek while we spent our lunchtime watching them and getting heaps of photos. Yes, there is a platypus here. Somewhere. By early afternoon we swung into Mulligans Campground. Our walking trip through this little known World Heritage site was over. But the drizzle wasn’t. Thank goodness for shelter sheds.